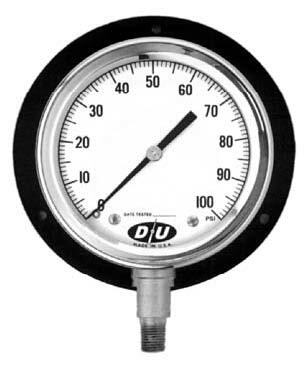 These handy, easy-to-read gauges are perfect where the gauge is mounted at a distance or where you want scale markings that are easy to read. the standard case is a heavy gauge aluminum with a threaded cover ring. 1/4" MPT brass connection standard. 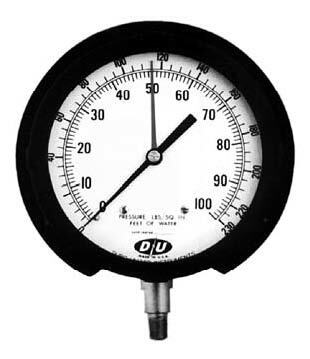 These gauges have a dual scale which reads PSI and Feet of Water. These are particularly useful for measuring the height of water in heating systems, tanks, standpipes, etc. 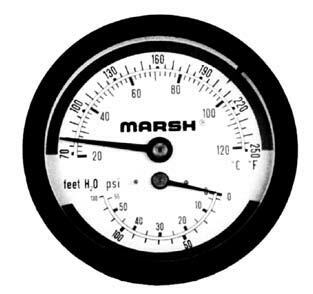 Specially designed for hot water heating systems, these combination temperature/pressure/altitude gauges measure pressure in PSI, 70–250°F temperature, and altitude in Feet of Water Column.